Branco Gypsum powder for wall plaster is sourced from some of the best mines in the Mediterranean belt where the quality of natural gypsum rock gives close to 100% pure Gypsum powder after it has gone through the process of calcining in state of the art processing plants. Our great Indian scientist has developed "Vedic Plaster"
which is made up of "desi cow dung "
Owing to the wide experience of this domain, we are instrumental in offering Printed Ultratech Readiplast Wall Plaster to our clients. Owing to our vest industry experience and knowledge, we are engaged in offering our clients a wide range of Interior Wall Plaster. The offered wall plaster is well checked at our end on quality aspects for supplying a pure range. This wall plaster is processed using supreme class ingredients as per the set industry norms. Square 1 Worldwide Pvt. 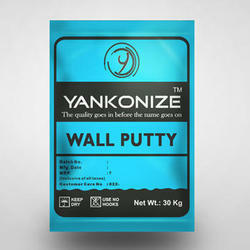 Ltd.
We are providing a comprehensive series of Wall Plasters. These products are enormously used by clientele for their nominal prices and top features. Capitalizing on the capability of our enthusiastic workforce, we have been instrumental in delivering a comprehensive collection of Wall Plaster Finishes. - Wall Texture is suitable for Interior and Exteriors. - Can be customized to the user’s requirement, and a wide range catering to practically all the segments.